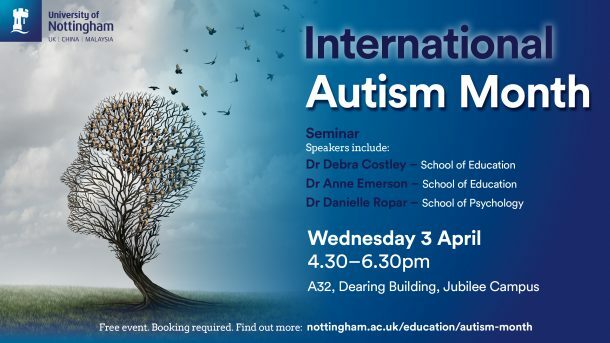 This event is being offered by the School of Education to celebrate International Autism Month and to raise awareness of the needs of young people on the autism spectrum. 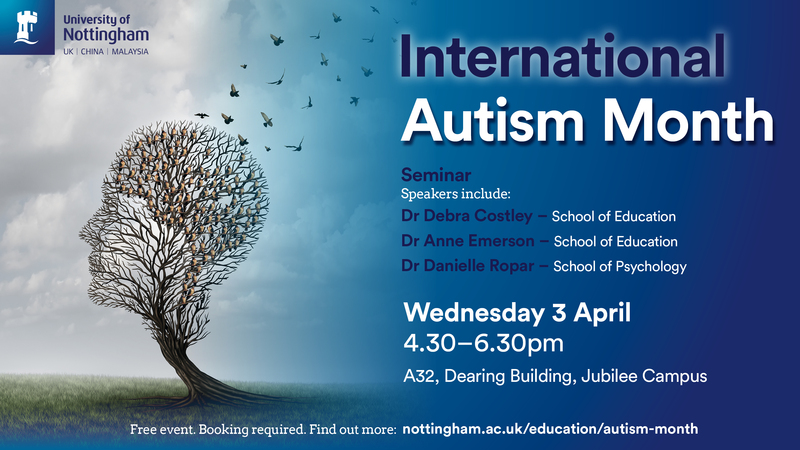 We will share the outcomes from new research carried out by a team from education and psychology with co-researchers who are young autistic adults. The project aimed to identify the extent of anxiety in mainstream secondary school students on the autism spectrum and the strategies they have developed to manage their anxiety. We will also have data from a new programme to train police officers to identify and support autistic people who come into contact with the criminal justice system (seven times more likely due to societal misunderstandings). We can learn from this project about how we manage challenging behaviour in schools. We will also have a panel of autism education experts who will take questions from the participants. We encourage you to email your questions prior to the seminar to ensure we can provide you with a full answer. This event will take place 4.30-6.30pm on Wednesday 3 April in A32, Dearing Building, Jubilee Campus. Attendance is free, please register on the website. Refreshments will be available. PDA is not recognised in some counties across the UK with parents left fighting for the right support for children who fit the profile. This often leads to increased mental health issues for their children with PDA who do not receive the right support in schools where strategies and interventions are designed for more ‘typical’ ASD pupils. How do parents try to get the right support for their children to minimise/eliminate school refusal, social isolation and further mental health issues which result from incorrect strategies being adopted by schools and supporting local authority bodies? What does the latest research suggest regarding PDA?